Gingerbread Bundts with Cinnamon Glaze are great for a special weekend breakfast or a tasty treat after dinner! It is such a busy time of year, but I am loving all of it! I truly love watching my kids come down in the morning to find Sparkle, their little elf that has visited us the last two years. I adore their excitement for Christmas and the joy that shines in their smiles! It is truly amazing to see my kids “believe” and they melt my heart! Their wish lists are long with large items this year and oh my goodness are they going to be beaming when they wake up on Christmas morning. I can’t wait!!! On top of the usual school, baseball, and gymnastics activities and daily routines, the to-do lists are never ending right now and I don’t sleep much anyways. But…when I saw this recipe, I knew I had to set the alarm a little earlier and make these for my family. The house smelled amazing and we loved them!!! My husband went right back for seconds. Don’t worry, I also fed them eggs and fruit! 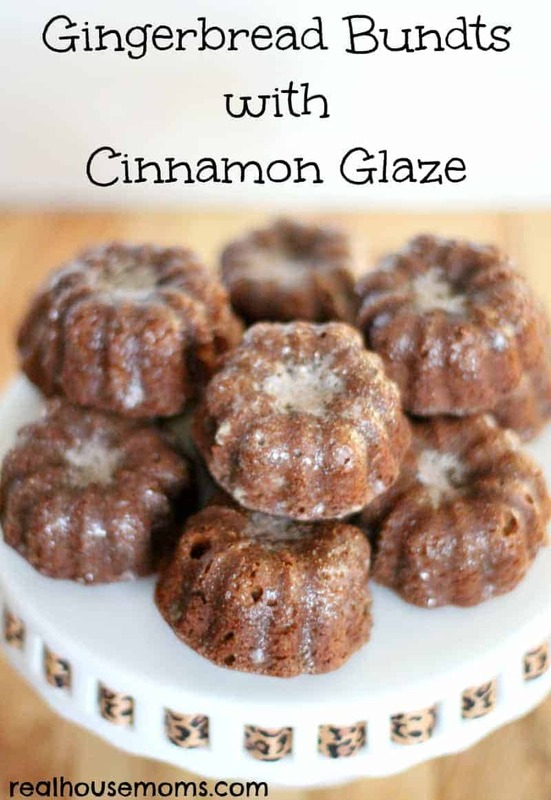 Gingerbread Bundts with Cinnamon Glaze are great for a special weekend breakfast or a tasty treat after dinner! The glaze compliments the bundts perfectly! Your house will smell amazing! These are just darling and look so tasty. Thanks so much for sharing at Weekend Potluck! Love this for the holidays! Thanks for linking up with What’s Cookin’ Wednesday! Wow wish i had seen these earlier i would of made them for sure. Merry Christmas. I absolutely love gingerbread! Can’t wait to try these! HOw many does the recipie make? Also, can they be frozen , unglazed, then glazed after freezing? I have diabetics in my family and would need to used a sugar substitute as much as possible. I’d really like to make them and take them to my dads for the holidays. Don’t have a mini bunds pan, but I have one that’s a mini tart pan, like for making pecan tansies. Many thanks! Can this be adapted for a muffin pan OR for a full sized bundt pan?